Vicks DayQuil Severe Cold & Flu Liquid - Maximum symptom fighting ingredients to relieve your worst cold symptoms*. Vicks NyQuil Severe Cold & Flu Nighttime Relief Liquid - Maximum symptom fighting ingredients to relieve your worst cold symptoms*. 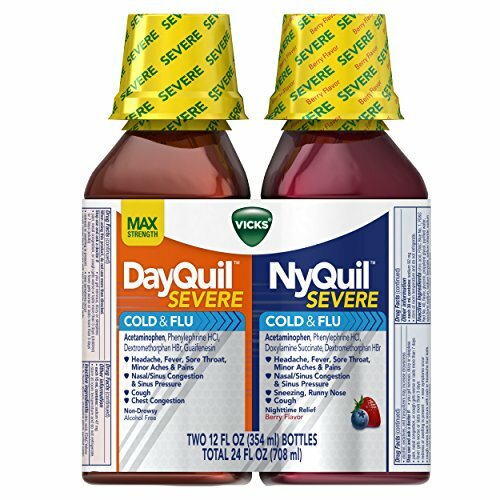 Vicks DayQuil Severe Cold & Flu Liquid - Non-Drowsy.Vicks NyQuil Severe Cold & Flu Nighttime Relief Liquid - Nighttime.